Print design in 1:1 size (actual size). Make letter pattern by cutting out each letter close to the inside line of satin stitching. (See Fig. 1). Iron on adhesive backing, such as Wonder Under or E-Film from Dalco Athletic. Use pattern on your fabric. Stitch outline stitch and stop machine. 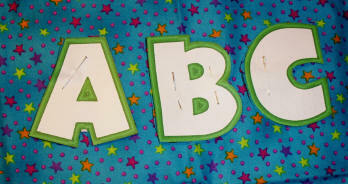 Use temporary adhesive spray on each letter before placing on garment prior to stitching. After stitching applique, slit a tiny hole on the other side of the applique and stuff with fiber fill (cutting through backing and garment, not applique). Another way you can achieve this is to stop the machine just before the cover stitch in completed and stuff with fiber fill with the edge of a pencil and then start the machine to finish cover stitch. Print the design actual size. Spray adhesive on the back of the printed design. Lay it on a piece of heavy cardstock (I recycle the cardstock found in shirts, and other items that is used as packaging from the store). Cut the design on the edge (in the middle of the satin edge stitch). Mark each template with "this side up" and the name of the design so that you cut on the right side. Trace the design with "this side up" on the wrong side of the fabric. These templates last a long time when they are cut from card stock rather than paper. Click here to watch a beginners applique video by Embroidery Library. Use your browser button to click back to this web site. Click here to download your free True Sizer software from Wilcom. This software will allow you to resize and convert your designs in most formats. It will also change the density as the size changes. Resize and convert your embroidery designs. This software will also adjust density when it is resized with the .emb format. Click on the icon to download. The true view is awesome when viewed in true view.